Our greenhouse and agricultural sprayers are used by growers in greenhouses, nurseries, vegetable farms, fruit orchards, and flower gardens. Options include gas or electric motors, and tanks from 55-200 gallons. 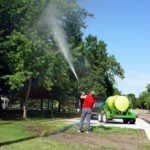 Our sprayers are built to last and versatile enough to change as your needs change. The system provides continuous “high action” re-circulating tank agitation. A “Chem Saver” tank shutoff valve, allows reclaiming of excess chemicals and permits cleaning of the hose and pump, with chemical still in the tank. Only top quality Cat pumps are used. Honda or Briggs & Stratton gasoline engines are available. 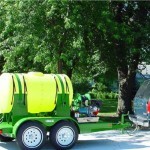 We have the capability of custom designing sprayers to meet your specific needs. These are just a few examples of configurations specially built per customer request. This entry was posted in Greenhouse Supplies on October 31, 2012 by admin.